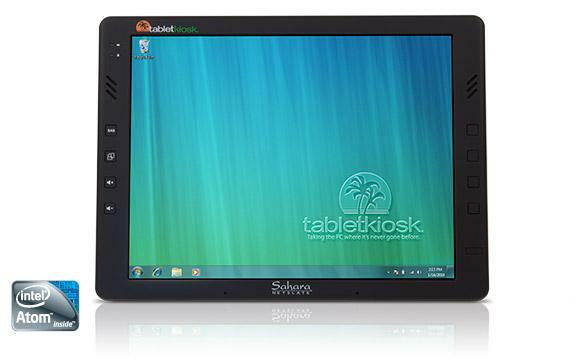 The 12.1 inch Sahara NetSlate a510T Tablet PC. Because doing more for less is good business. Whether for self-service kiosks, table-side order taking, remote systems control, or even just browsing the web and checking e-mail on the road, the Sahara NetSlate a510T slate-style Tablet PC, powered by the Intel Atom D525 processor, is the smart networked computer that wont limit your productivity or stifle your sense of mobility. The Sahara NetSlate a510T features a full 12.1-inch wide-view WXGA Resistive Touch Screen, dual channel WiFi 802.11a/b/g/n networking, Bluetooth 2.1+EDR and is available with your choice of Windows 7 Professional, Windows Embedded or openSUSE Linux. Intel Atom D525 Processor for longer battery life while running cooler. 1.0 GB RAM (upgradable to 2.0 GB) and a 40GB HDD standard (SSD drive optional) for running Windows 7 Professional, Windows Embedded Standard 7 or OpenSUSE Linux. Built-in Dual-Band Intel Wi-Fi 802.11 a/b/g/n, Bluetooth 2.1+EDR means you can stay connected no matter where you go. Built on the same 12.1-inch form factor, the a510T is compatible with all accessories for the Sahara Slate PC i500 series Tablet PCs. This means integration into an existing installation is seamless, requiring no peripheral or mounting solution upgrades. Single-Chip Trusted Platform Module (TPM) for the enhanced data security that enterprise-level companies demand. User upgradeable memory and storage allows the system to scale along with your future requirements. All this for hundreds less than the Sahara Slate PC Tablet PCs, for when you don't need all the features or processing power that the Sahara Slate PCs offer.